Like most young carpenters, Shawn Mahler was more focused on working fast than working safely. “The thing at work is speed,” he says. “Get it done, get it done, get it done.” So he didn’t think too much about the potential for injury from “bump nailing” with a nail gun equipped with a contact trigger. At least not until he nailed two of his fingers together while framing walls on a concrete slab. The first time he nailed through bone came while shooting sole plates into the subfloor. He ran out of hose, so he gave it a yank. 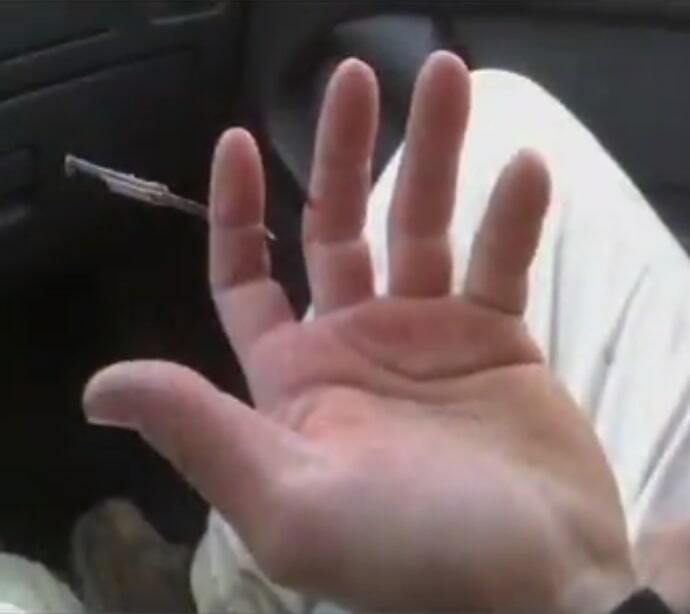 That pulled his hand down, pushing the gun tip into his boot. 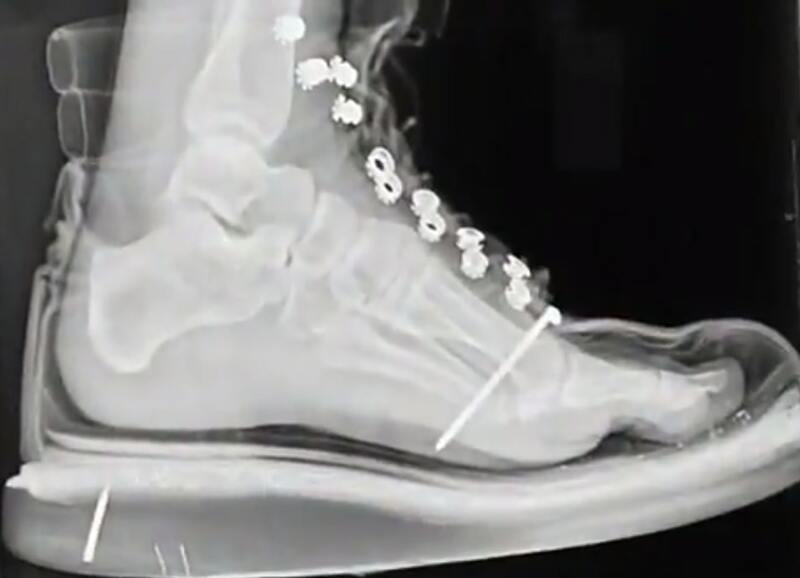 The result was a nail through the foot – the picture above is the x-ray he got in the emergency room before they yanked the nail. He lost a month of work. Nail gun triggers come in two flavors, sequential and contact. With a sequential trigger, the nose piece has to be depressed before the trigger can be pulled, and once a nail is fired, everything resets. By contrast, a contact trigger can be pulled and held, allowing a nail to be driven every time the nose piece “bumps” against the work. Bump nailing is fast, and for those of us who’ve done it (and who hasn’t), it’s kind of cool. It’s also dangerous. In fact, contact triggers are involved in twice the number of serious nail guns injuries as sequential triggers. Caleb Miller had been a carpenter for about 18 months when he was recorded for this video, in which he tells the story of this photograph. He was holding soffit framing in place with one hand, and pulling the trigger on his contact-trigger nail gun with the other. “I think I got a double fire,” he says. Accidental firing from rebound or recoil is perhaps the most common way contact-triggers cause injuries. “I thought I had my hand back far enough,” he says, “but … I shot my two fingers together.” One finger came unstuck when he shook his hand, but the nail went clean through the other and required a visit to the emergency room, then the hospital to remove it. He’s not alone. According to CPWR (The Center for Construction Research and Training), one apprentice program found that 44% of it apprentice carpenters were injured by nail guns before they finished their training. His first nail gun injury occurred within a year and half of his first carpentry job. He was framing a wall on the subfloor, nailing studs to a top plate, got a double-bump, which missed the plate and nicked the fleshy part of his thumb. The second incident: “I nailed my foot through the band board to the top plate with a 16d nail.” Flesh wound only. The third incident: While nailing down with the gun above his head, a nail ricocheted into his forearm. This one got him in the bone. Only his foot injury was treated by the ER. “Duct tape and napkins were our stitches … and we went right back to work.” Roberts didn’t take any time off work to heal. “That’s money lost, money out of my pocket that I couldn’t afford to lose,” he says. —These videos are among a trove of information on the website of CPWR, the Center for Construction Research and Training, whose mission includes work to reduce or eliminate construction hazards, provide training resources, and conduct research on: working conditions; the impacts of new technologies on workers and working conditions; and analysis of corporate and government policies and consensus standards that affect the worksite.